Royal Wedding 21st Century Tea Dance Party! We are thrilled to be part of (B)old, a new festival profiling artists aged 65 years and over at London’s Southbank Centre. (B)old will feature artists who are established in their practise and recognised nationally or internationally for their work. (B)old celebrates great artists who stand the test of time and doesn’t shy away from the issues facing them. In industries that often celebrate and cater to the young, when are you truly ‘in your prime’? What impact has age had on your artistic practice, and how do you stay relevant? This will be a tea party like no other. As you might be aware, we take the traditional form of a tea dance and bring it kicking and screaming into the 21st century. 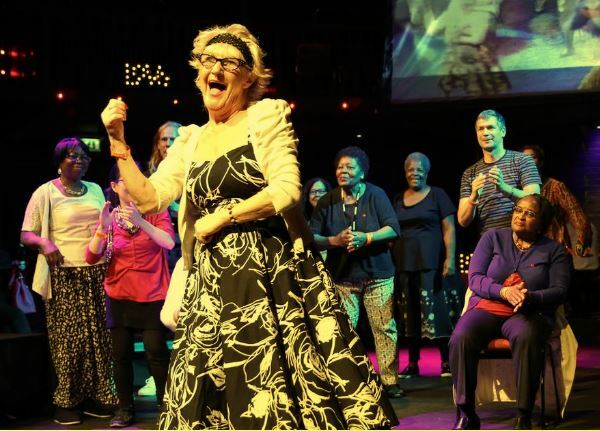 Like a big old family party, this afternoon of delights at Southbank Centre offers a royal wedding-themed bonanza of dance, music, song and royal fun. Co-curated with older members of Entelechy Arts Elders Theatre Company, members of Meet Me at the Albany, and artists in the care homes programme Walking through Walls, and hosted by Christopher Green and his alter ego, the unforgettable Ida Barr, experience a multi-media event of live music, video, theatre, performance, storytelling, singing and dancing. Expect music from Jive Five, the Meet Me Choir, a guest performance from older Heart ‘n’ Soul artists, spoken word performances from older poets, aerialist dancers performing with their mothers, sing-alongs, catwalks, plenty of dancing and of course a big screening of Harry and Meghan’s wedding in this special royal treat. So put on your most regal of glad-rags for the best royal wedding party in town. Our Royal Wedding 21st Century Tea Dance is completely FREE so please pop in and join us. All the Details are here.